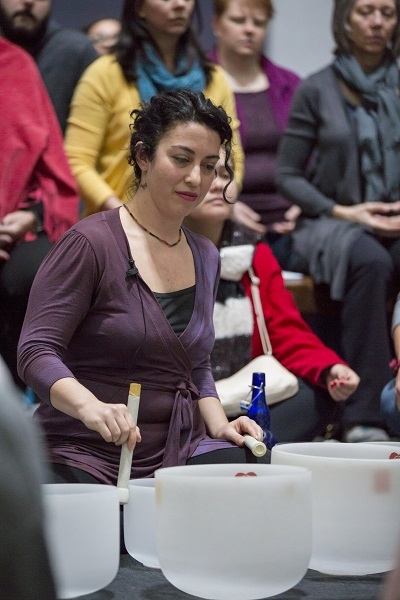 The Rothko Chapel honors the start of the New Year with the sound of crystal bowls resonating throughout the Chapel, led by yoga teacher and Bayou Bliss Yoga founder Dana Shamas. We begin the year with a fresh intention through the cleansing vibrations of the bowls. Dana’s passion for health and wellbeing comes from the heart. As a therapeutic yoga teacher, breathwork facilitator, biofield tuning practitioner, and crystal bowl musician, Dana understands how complementary tools in the healing arts can facilitate a profound and lasting transformation. Her work as a certified practitioner in biofield tuning brings structure and form to the power of healing vibration that is available to all beings. With her generous spirit and open nature, she creates a safe and nurturing environment in which her clients can explore, release, receive, and heal. Dana’s previous work in the world of business and finance gives her a unique perspective on the challenges we face day to day, and how elusive a sense of wholeness and harmony can be. Dana knows that harmony within ourselves gives us the capacity to create a more harmonious life. She is dedicated to helping people find a deeper connection to their Higher Selves so that they may fully express who they are and what they are meant to do.